Both summers that I worked as a prospector we worked the “long week”: 11 days in the field followed by 3 days in town. I saved all my money, because many slightly older folks (i.e. in their 20s) worked the long week and then spent all they earned in the three day periods in town. They were generous, if not sensible, while drunk and well supplied with female companionship. 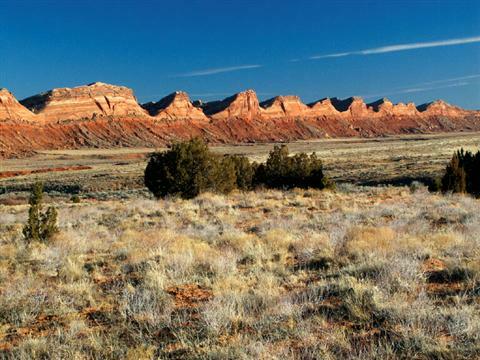 In White Canyon, usually two Exploration Incorporated men worked overlapping long weeks. While in town we bought food to last for the full time out in our home tunnel. We had little propane refrigerators which kept our steaks edible for about half a long week but we got used to scraping a bit of mold off them before cooking towards the end. (Bacon was practically immortal under our conditions.) We could refill our the jeeps’ 40 gallon tanks with potable water at Hite, down on the Colorado River (now way under Lake Powell) about 10 miles away. Towards the end of one long week late in the summer we ran out of food early so I decided to drive 70 miles up to Blanding, Utah to buy some more. The desert is HOT during the day so I started out about 5:00 pm. I got about 2.5 miles past Fry Canyon when the jeep simply would not go any more. A pretty rudimentary inspection showed that an axle was broken. (I no longer remember which one.) It was not yet quite dark, but was already cooling off so I hiked back to Fry Canyon, found a mechanic, told him where my jeep was, and gave him the key upon his agreeing to tow the jeep back, weld the axle and get it going again. By then the temperature was pleasant and the sun had long since gone down. There must have been a moon because I do not remember any trouble seeing. I decided my best bet was to hike back the 18 miles to the Four Aces Claim along highway 95. I thought there was a good chance (say 30%) that someone would drive by and I knew they would give me a lift. 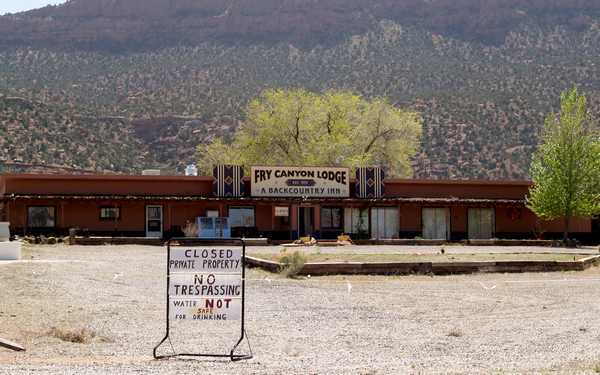 A recent picture of Fry Canyon Lodge built in 1955 and (as its web page notes) far (30 miles?) from any other building. I had probably gone about 5 miles when I heard a vehicle coming up behind me. Of course it stopped when I put out my thumb. The beat-up pick-up truck held one old prospector. He was friendly and as soon as I said where I was headed he agreed to take me. I had already taken in that he was holding a fifth of something (rum, as it turned out). When I got in I was pleased to see that it was almost empty. I stressed that he only needed to take me to the bottom of the cliff. Of course he offered me a drink. Figuring that the more I drank the less he would have, I took a pretty good pull in spite of the fact that I was not at all used to hard liquor. I was very disappointed when he drained the bottle and puled out a new full fifth. Prospectors are very interested in what other prospectors are doing; that is a primary responsibility. When he asked I told him the preposterous tale that we were thinking of opening the Four Aces Mine for copper. (Lies are what prospectors tell each other.) Of course he knew I was lying but I was sure he would pretend to believe me so he could ask lots more questions. I had fun thinking up consistent but far-fetched answers. He was in a happy state and I think he was having fun also. We got to the bottom of the Moenkopi cliff. I opened the door before he stopped and said I would hike up, but of course he would not stop. So we went up the narrow road gouged into the cliff until the bumper stuck over the end with a 50 foot drop ahead. 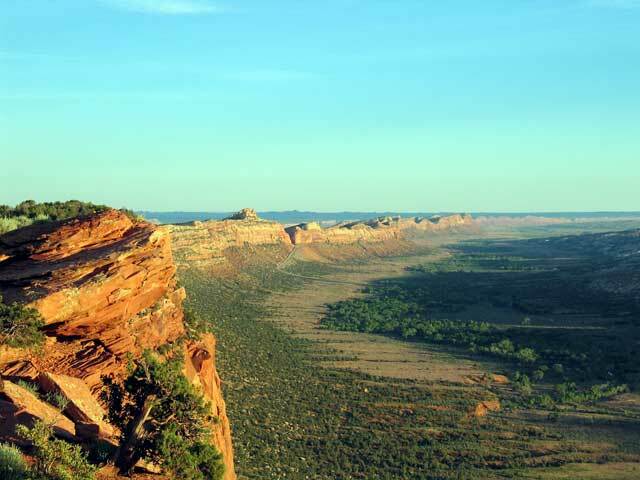 He had no trouble backing up the next narrow stretch stopped exactly in the right spot a few inches from the 120 foot drop, lurched forward up the next steep stretch and made the extremely sharp turn to get his truck up on top of the Moenkopi. We drove about a mile on the Chinle until we came to the end of the Four Aces tunnel. (When he got out I was interested to see that he could walk pretty well in spite of extreme inebriation. I had already admired and been relieved by his driving skills in this condition.) I had expected to see my buddy, but it turned out he had gone for a night time stroll. He had even padlocked the tunnel door. Naturally my drunken friend wanted to see the tunnel and it was easy to show him all sorts of copper ore, so I took him back all the way (about 225 feet). What did my buddy see? A strange pretty bad looking pickup where no one was likely to come on their own. A padlocked tunnel door unlocked and two men at the back of the tunnel. I held the lantern up to my face hoping he would recognize me but we were too faraway. I yelled, but if you have ever been in a mine tunnel you know that sound bounces off the floor, walls and roofs and cancels out in 20 or 30 feet. So my buddy quite naturally picked up one of the rifles we kept just inside the tunnel door and pointed in in our direction. Under the circumstances there was no need to aim at us because we were in a straight tunnel with no escape. Aiming would have been taken as bad manners whereas pointing the gun more or less in our direction was only to be expected. Soon he recognized me. When we got close I briefly explained. We told the old guy a bunch more tall tales and he left after awhile. The next morning I went out early looking for a wreck, but he either got down during the night or did so before I came looking. I wonder whether he finished the second fifth? The most spectacular feature on the trip from White Canyon to Blanding was Comb Ridge. Since I have no other pictures relevant to this story I will put in pictures of this amazing feature even though I did not get close to it on this trip. The first picture shows Utah Highway 95 crossing Comb Ridge in the middle distance (the prominent natural notch). Although the picture is modern, from this distance it would have looked the same in 1955. 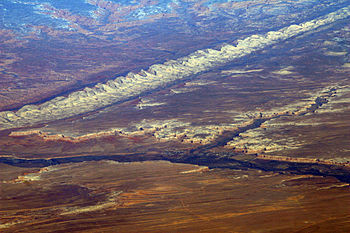 The next picture is about 25 miles of Comb Ridge from a high altitude airplane. It runs almost exactly north-south. The final picture shows the appearance from the west. I believe you can see why it was named COMB RIDGE.